O passeio foi sensacional. A agencia de turismo me buscou no hostel. Foram passando em otros hostels para buscar outras pessoas. Éramos: eu (brasileño), duas colombianas, um Casal holandés, um americano e um australiano. Tinham dois guías acompañando Nosa trilha, então um explicava as historias em ingles e o outro em español, assim todos ouviamos como preferíamos. 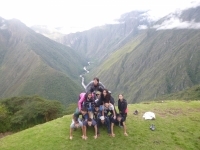 The Machu Picchu trip was tiring bonding, thrilling and very satisfying. I've done different trips in different countries, but the sceneries I've seen here were overwhelming. 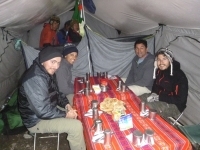 The feeling of ending a trip well organized with our guides, porters and cook and the friends made on the way is great. 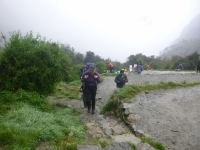 Hello, I have survived, yeaaa, todo comenzó con una idea loca de hacer el Inca Trail, de ganas de sufrir en palabras de otras personas porque holidays y having fun no es caminar por 4 días. Sin embargo, que puedo decir, ha sido una experiencia maravillosa y excitante. Do not look up ! The first time I experienced Machu Picchu was seven years ago by train only. 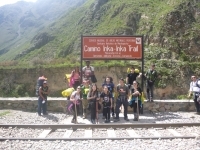 If you're thinking about visiting, I highly suggest trading the train experience, and doing the four day trek with Inca Trail Reservations. Considering this was my first multi-day trek, and at a high altitude, I wasn't sure if I'd enjoy it. My compliments to the porters and Victor and Francis. Everything was above my expectations. Excellent food. Tents well prepared. Wake up tea in the morning. Even tables and chairs in a real dining place. 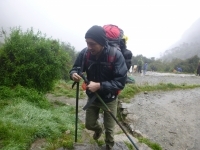 The whole climbing and walk was a challenge for me and exhausting. 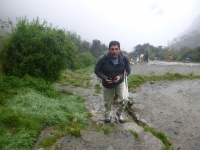 But the reward was Machu Picchu and the huge mountains surrounding it. Quiero agradecer por este momento tan especial que me llevó retar mi cuerpo y mi mente para lograr este hermoso desafío. Vale totalmente la pena realizarlo. Soy una Amazona y lo logré ! A los guías gracias por regalarnos su tiempo y paciencia, cada una de las explicaciones reflejan el conocimiento y amor por la cultura Inca. 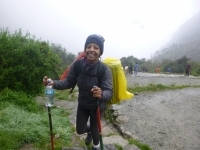 I was so happy to be able to do the Machu Picchu hike this January. 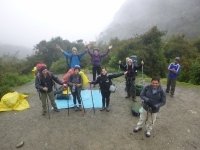 To explore the Andes mountains by exploring the Inca Trail, seeing many fantastic ruins and old buildings along the way, was a dream come true. This was definitely one of the most amazing and memorable trips I have completed in my life. This was actually my first: hike, sleeping in a tent, not showering for a few days and continuously walking four days straight without Internet. Amazing experience ! 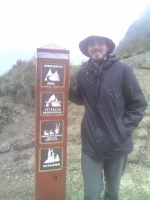 Life goal of trekking to Machu Picchu achieved. 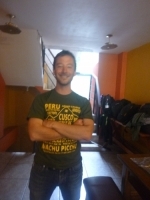 Our guides Raul and Grober were fantastic, knowledge of the area and information shared with us was invaluable ! 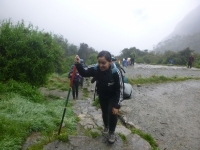 The trek was very challenging and the guides helped me all the way to achieve my goal of reaching Machu Picchu.